The NC DOT is busy with a major road project in Winston-Salem and a portion of I-40 Business (between Hwy 52 and Cloverdale Avenue) is closed to all traffic. This closure impacts the majority of the routes into downtown Winston-Salem. Below is the NC DOT website link which gives the most current project updates as well as road detours and new traffic patterns. At its 91st meeting, the Presbytery of the Mid-Atlantic voted 136-11 to move forward with the vision of multiplying from one to three presbyteries. 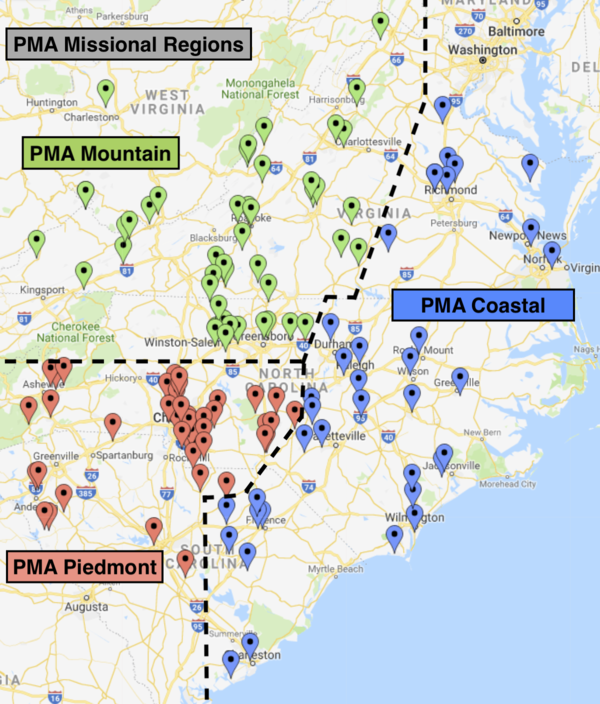 Initially, we will begin to move toward three missional regions and when structure and finances are developed in each of the regions, the PMA will multiply into three new presbyteries. This will likely take us 3-5 years and require approval of the General Assembly. Thanks to the Presbytery Multiplication Study Team led by Dr. Bill Enns and including Moderator Duke Lineberry, Scott McGregor, Ken Priddy, Powell Sykes, Jan Teagle, and Wes Vander Lugt. Read this important information to learn more about our future. View PMA Missional Regions in a full screen map. Zoom in or out for more detail. Click on flags to see church names and addresses.